David S. Ferriero, archivist of the United States dons white gloves while showing two newly discovered albums containing photographs of art works and furniture stolen by the Nazis during World War II after they were unveiled at a news conference in the Meadows Museum at SMU in Dallas, Tuesday, Feb. 27, 2012. The Dallas-based Monuments Men Foundation for the Preservation of Art had been contacted by relatives of two World War II soldiers who took the albums from Hitler's home. They'll be donated to the U.S. National Archives. AP Photo/LM Otero. 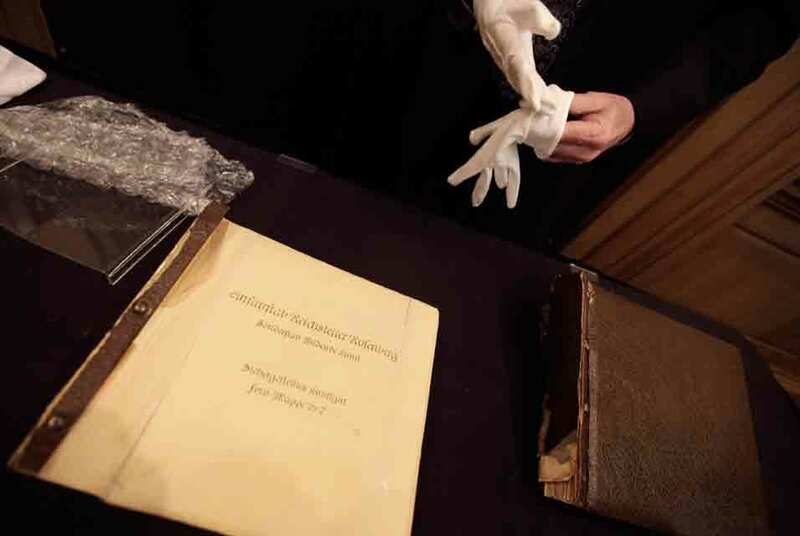 DALLAS (AP).- Two albums documenting works of art and furniture stolen by the Nazis during World War II were unveiled Tuesday after being discovered by a Dallas-based foundation that was contacted by relatives of two soldiers who had taken them from Adolf Hitler's home. Robert M. Edsel, founder and president of the Monuments Men Foundation for the Preservation of Art, said a Dallas news conference that the albums are "key pieces of evidence taken from a crime scene that were prized possessions of Adolf Hitler." The albums, which will be donated to the U.S. National Archives, were among those created by the Nazi agency Einsatzstab Richsleiter Rosenberg, or ERR, documenting the items they had taken from across Europe. One album includes photographs of 69 paintings that were taken as early as 1940. Another contains photographs of 41 pieces of furniture, mostly taken from the Rothschild family. The albums will bring the total number of ERR albums in the custody of the National Archives to 43, including two others that were donated in 2007. "We can only hope for more discoveries in the years to come," said U.S. Archivist David S. Ferriero. For decades, the 39 ERR albums discovered stored at Germany's Neuschwanstein Castle and were later used as evidence at the Nuremberg trials to document Nazi looting were thought to be the only survivors of about 100, he said. The Monuments Men Foundation continues the work of those who helped Allied forces protect cultural treasures during World War II and after the war helped return stolen items. "It was the greatest treasure hunt in history  one that continues to this day," Edsel said. Greg Bradsher, senior archivist at the National Archives, said that the albums are a reminder of the massive amounts of properties that Hitler took and a reminder that "to this day, hundreds of thousands" of items are not with their rightful owners.